The history of Seville, Spain's fourth-biggest city, spans more than 3,000 years and during this time it has crossed paths with literally dozens of civilisations. 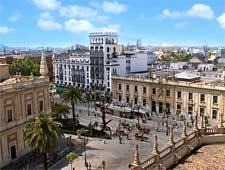 Much of the city's history and heritage is very much tied into the Guadalquivir River, which separates the two halves of the city, Triana and Sevilla. Exactly 500 years after Christopher Columbus first set sail for the New World from Seville, the Andalucian capital hosted the 1992 International Exposition. This hugely popular expo resulted in the city receiving a new airport, a speedy bullet train service to Madrid, improved streets and a booming tourism sector. Seville's archaeological museum contains bronze instruments belonging to the city's earliest residents, the 9th-century BC Tartessian tribe. The area became Carthaginian territory around 550 BC, but when the Carthaginians fought the Romans during the Punic War of 216 BC, the small town named Sevilla was destroyed. The Romans finally conquered the area some ten years later. During the Roman period of the history of Seville, the city was called Hispalis, but the Romans first settled in another nearby city named Italica. Although remnants of a Roman temple, aqueduct and square survive in Seville, Italica, just 10 km / 6 miles from the city, is even more well-preserved and provides a better picture of how the city would have looked in ancient Roman times. Hispalis became an important Christian centre in the Iberian Peninsula, but that soon changed after the Visigoths and Vandals conquered the city around the time of the 5th century. Islam became the dominant religion and Hispalis was renamed Isbilya when the Moors conquered the city in the early part of the 8th century. The city's Moorish era lasted until the 13th century and several buildings from this time period still stand here today, including the cathedral's Giralda bell tower, the Patio del Yeso and the ancient city walls. The body of Castilian King Fernando III, whose army ousted the Moors from the city in 1248, still lies in Seville Cathedral today. The Castilian royal family moved into the Moors Palace and all of the local synagogues were subsequently converted into churches in the 1390s. Many of the city's Jews were either killed or forced to convert into Christianity during this time. The true 'Golden Age' in the history of Seville began in 1492, when Christopher Columbus made his first legendary voyage to the New World. 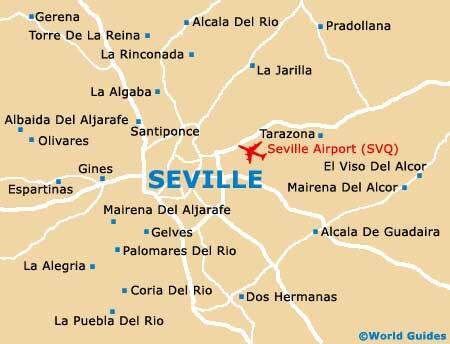 All goods arriving in Spain from the newly discovered lands of the New World had to first enter Seville's port. The city became the only place where European merchants could purchase supplies from the New World. Seville greatly profited from its new gained power and wealth, and its population reached almost one million just a century after the first expedition of Columbus. The city's Golden Age came to an abrupt halt when its New World trade monopoly ended during the late 16th century, followed by a mid-17th century plague which slashed the population by nearly 50 percent. 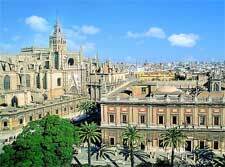 It would take over a century for Seville to recover from these disasters. Although the city failed to achieve its former glory, it was nonetheless Andalucia's largest and most industrialised city during the turn of the 19th century. Both the Parque Maria Luisa and also the Plaza de Espana were opened in time for the 1929 Iberian-American Exposition. When the Spanish Civil War began in 1936, Spanish General Queipo de Llano quickly captured Seville, encouraging its peasants to protest the uprising. 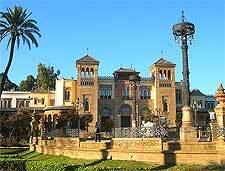 After the 1975 death of General Franco and his dictatorship, Seville prospered and grew into its current status as a modern city capable of hosting the 1992 International Exposition and the 1999 World Championships in Athletics. 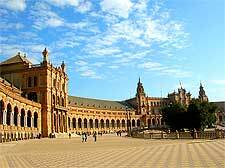 Although the city was disappointed to fail in its recent Summer Olympics bids (2004 and also 2008), the unique history of Seville continues to attract countless tourists.